Take out Ranger Hughes and Andrew Perry, sniper style. 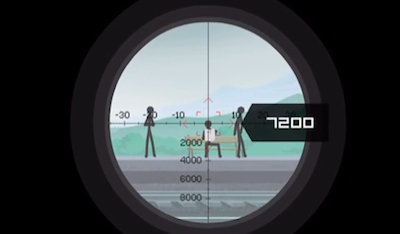 It's hardly a game for the squeamish - you are playing a sniper, after all - but Clear Vision 3 offers a quality arcade-style experience where you take out targets by lining them up in your sights, adjust for wind and distance and then let the bullet fly. For our latest walkthrough, we've got tips that will help you beat missions 11 through 15. They get a bit difficult, so make sure you use them to your advantage. This target is a bit tricky, as he keeps moving around inside a house. What you want to do is wait for him to get to the window on the left side, as that's the best place to take your shot. Also, you'll need to compensate for distance, as well as -20 wind compensation. That means you'll need to line him up to the -20 mark on your scope on the left, as well as the 6000 meter distance on the bottom. In essence, you're basically aiming your rifle in the middle of the upper right part of the roof. 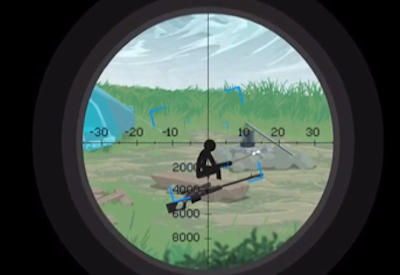 Once you see the mark stand there for a few seconds, check the markings on the scope, then take your shot. This next mission calls you to take out a scumbag reading a newspaper on a park bench. However, there's a problem. The wind compensation is up to -25 degrees, and he's quite far away. Plus, there are two civilians around him. 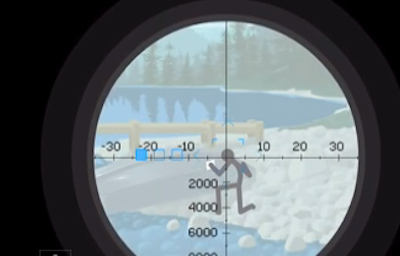 You'll need to adjust your scope to the left hand side between -20 and -30, and also judge for distance. Raise your scope up to the right hand side, to the point where the man's head is barely visible on the bottom left corner of it. Line up both the -25 and 7200 sides, then take your shot. He'll drop with ease, and you won't hurt the others. There's a park ranger who's breaking the rules with poaching, and someone wants to protect the wildlife at all costs - so it's your turn to do the hunting. Ranger Hughes will be sitting at the campsite, though you need to adjust for 10 wind compensation and 3600 distance. 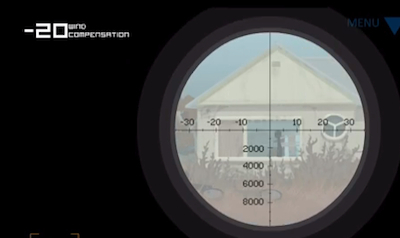 Adjust your crosshairs so that they're pointing just to the right of the tent, using the number 10 and 3600 on the scope. Once you have your shot good to go, take it and his reign of crime against nature will be over. Here's another mission where you have to take out someone and make it look like an accident - so a direct shot simply won't cut it. Pay attention to the cross beam which is located in the upper left part of the stage. You'll need to adjust for -10 wind compensation as well as 3600 distance with the left cable. Adjust your scope so you're just barely above the center of the crossbar, then make adjustments with the -10 and 3600 meters on your readings. 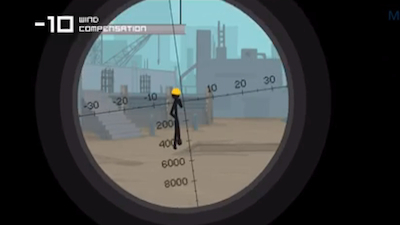 Take the shot, and the cross beam will knock the poor sap into a pit, where he'll be covered with cement. This next mission requires you to take out a target who's performed some vile acts, but has plenty of time to polish his boat. It'll be tricky, especially if you have a low-grade rifle. This would be a good time to upgrade, though you can still take a chance with an older rifle. You'll need to handle -20 wind compensation and 10800 distance. Aim your shot near the top of the trees on the right hand side, then adjust accordingly with your -20 reading and distance. Take the shot and he'll be sleeping with the fishes.